Hot off of the press! 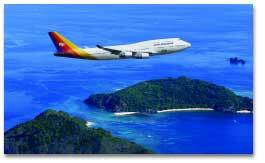 Air Pacific has a new Tabua class airfare to Fiji! Our exclusive Tabua class (first class) Fiji airfares Start at $2955 round trip per person from Los Angeles to Nadi. Taxes run approximately $145 additional per person, and will fluctuate due to currency conversions. Coach is also running at unprecedented low prices, starting at $9oo round trip per person from Los Angeles, plus taxes of around $145 per person. There is no charge for up to 2 pieces of checked luggage. Space is limited and the offer is available for travel through March of 2013. Currently airfares must be purchased by July 31, 2012 but this may be extended. Bookmark this blog page as we will be updating accordingly. Airfares are non refundable once purchased. They are valid for one year from the date of purchase and changes will incur fees/possible added costs. Lastly, we can process Air Pacific tickets with American Express, something that the airline cannot do directly. If you are planning a honeymoon to Fiji, or just romantic getaway, we appreciate the opportunity to put an outstanding package together.